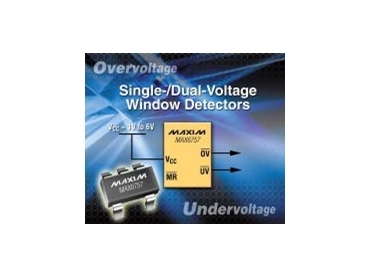 MAXIM Integrated Products, represented by Arrow , has introduced the MAX6754-MAX6764 single-/dual-voltage window (overvoltage/undervoltage) detectors. These devices are suitable for telecom, networking, automotive, power-metering, and industrial applications. The MAX6754-MAX6764 monitor system voltages from 5V down to 0.4V for overvoltage and undervoltage conditions with ±5%, ±10%, or ±15% windows. No external components are required to monitor from 0.9V to 5V. All parts have 0.5% hysteresis to prevent chattering at the outputs. The MAX6754*, MAX6755 and MAX6756 are single-voltage monitors with manual reset and a RESET-bar output that asserts when either an overvoltage or undervoltage condition occurs. The MAX6757, MAX6758 and MAX6759 are single-voltage monitors with manual reset and separate overvoltage and undervoltage outputs. The MAX6760, MAX6761 and MAX6762 are dual-voltage monitors with separate OV/UV outputs, a manual reset, and an OV latch. The OV latch used with the OV output, SCR, and fuse can protect systems from unexpected voltage spikes. The MAX6763* and MAX6764 are adjustable, single-voltage monitors with separate OV/UV outputs that monitor down to 0.4V. The MAX6754-MAX6762 require no external components to provide window detection with either a propagation delay of 20μsec or timeout option of 150ms. These devices are available in five-pin and six-pin SOT23 or eight-pin TDFN packages, and are specified for operation from -40°C to +125°C.